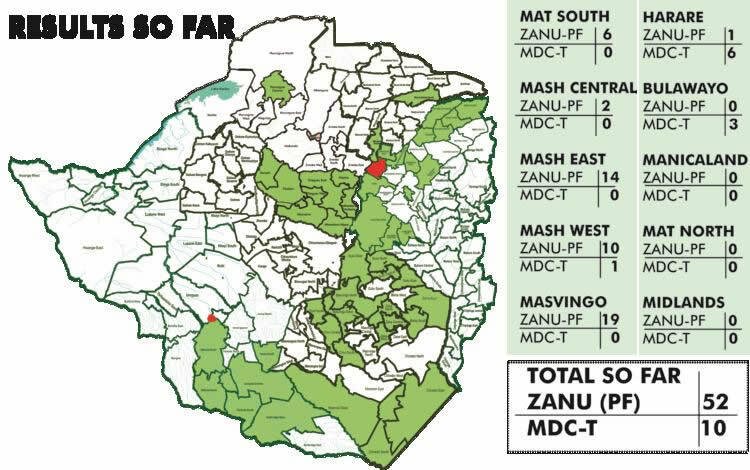 Out of 62 National Assembly results announced so far, Zanu PF has won 52 most of which are from Masvingo, Mashonaland East and Mashonaland West provinces. MDC-T has 10 seats so far, one in Chinhoyi, where Peter Mataruse defeated Phillip Chiyangwa of Zanu PF. 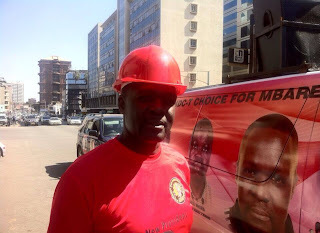 MKD leader and Former Zanu PF politburo member Dr Simba Makoni lost to Zanu PF's Patrick Chinamasa in Manicaland. 2200: RESULTS ANNOUNCEMENT: Zanu PF candidates who were retained are Webster Shamu (Chegutu East) Sylvestor Nguni (Mhondoro Mubayira), while former Ambassador and chairman of the Mineral Marketing Corporation of Zimbabwe Chris Mutsvangwa won the Norton constituency on a Zanu PF ticket. 2149:RESULTS ANNOUNCEMENT: In Bikita West Constituency, Zimbabwe Newspapers board member Dr Munyaradzi Kereke won on a Zanu PF ticket. He polled 6 270 beating Elias Musakwa who was also representing Zanu PF and polled 6 052. 2146: RESULTS ANNOUNCEMENT: Zimbabwe Newspapers board chairman Dr Paul Chimedza has won the Gutu South constituency seat on a Zanu PF ticket. 2143: RESULTS ANNOUNCEMENT: Phillip Chiyangwa lost the Chinhoyi seat to Dr Peter Matarutse of MDC-T. Chiyangwa polled 8 561 against 9 863 polled by Dr Matarutse. 2137: RESULTS ANNOUNCEMENT: Constituencies won by Zanu PF so far are Zaka Central, Zaka North, Zaka West, Chivi North, Chivi Central, Hurungwe Central, Chegutu East, Chegutu West, Mhondoro Mubayira, Mhondoro-Ngezi, Norton, Kadoma Central, Sanyati, Bikita South, Bikita West, Chiredzi East, Chiredzi South, Masvingo East, Masvingo North and Chakari. 2131: RESULTS ANNOUNCEMENT: Constituencies won by the MDC-T are Chinhoyi, Pelandaba-Mpopoma and Nkulumane.